But what to buy on this lazy, rainy, Sunday? The Literary Gift Company site is a gorgeous treasure trove of wonderful (and often rather random) literary related items. Today, one in particular caught my eye. 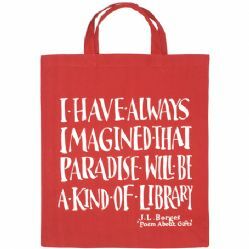 This lovely bag featuring a well-known Borges’ quote is eye-catching, cheeky, and also includes a donation to the National Libraries Day cause. And at £5 it’s a bargain! What a great site, never seen it before. I can see a lot of gift buying from it! Thanks for sharing it. Good blog too, I love reading reviews of crime almost as much as the books themselves. Thanks 🙂 There’s so many wonderful book-related things in their online shop I could spend hours browsing! I want to buy like all the posters on their website – and the mugs! Horray literary mugs! I know, they’re fab aren’t they. I can’t wait for Christmas now!